Twitter/royalscottkingThe remains of a Delta Air Lines Boeing 747-400 at a salvage yard in Marana, Arizona. 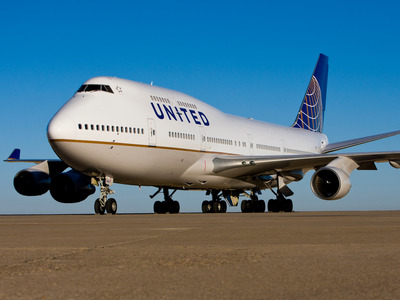 The Boeing 747’s run as a passenger carrier for major US airlines has come to an end. 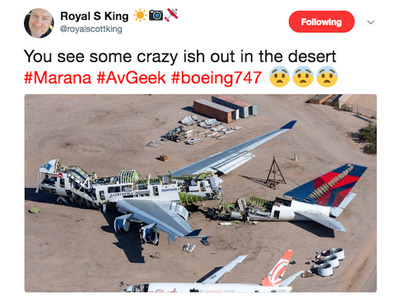 A picture posted on Twitter shows one Delta’s 747-400s being scrapped. The Boeing 747 is disappearing from the skies over the US. With the retirement of Delta’s fleet of jumbo jets in December, there are no 747s left in passenger service with any of America’s major airlines. And there’s no better reminder of this than a photo posted on Twitter by Royal S King showing the skeletal remains of a Delta Air Lines 747 as it is being scrapped at an aeroplane junkyard in Marana, Arizona. It’s a jarring visual that shows the fate that befalls most of these majestic beasts. In 2017, both Delta and United Airlines hosted farewell tours for their venerable jumbo jets with United’s fleet entering retirement a few weeks before Delta’s. Shortly thereafter, the planes are sent to salvage yards for storage. The warm, arid climate of these desert facilities minimise corrosion and keep the planes in acceptable condition should the airline find a buyer or need the aircraft to reenter service. But few people these days are in the market for 20-year-old jumbo jets, so Delta’s and United’s planes will likely be scrapped. Its expensive engines, electronics, and other salvageable components will be sold off for parts. 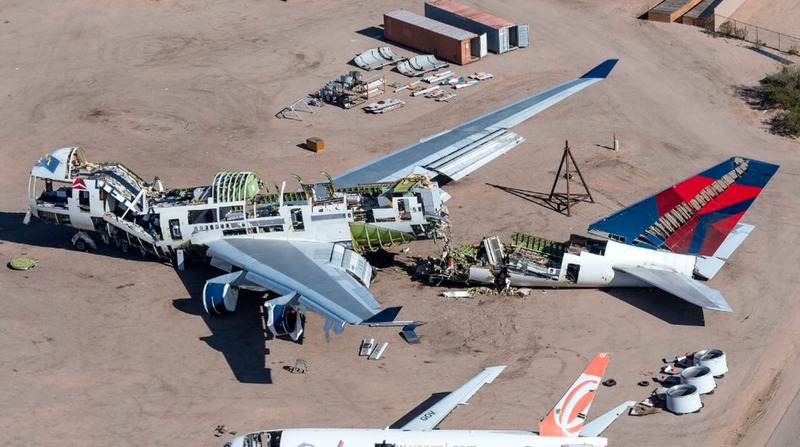 The remaining aluminium airframe will be cut up and sold as scrap metal. United AirlinesA United Airlines Boeing 747-400. Over the past 25 years, regulations limiting the use of twin-engine jets on international longhaul flights have become significantly less strict. As a result, airlines have replaced the larger, less-efficient three- or four-engine jets that dominated air travel during the 1970s and 80s with smaller twinjets. Aircraft like the Boeing 777 and the 787 Dreamliner or the Airbus A330 and A350 have taken the jumbo jet’s place as the workhorse for international airlines. As a result, it’s the end of the road for a plane we call the Queen of the Skies.